"All of our candles are hand poured with natural soy wax. They are made with a special hemp wick that burns clean. Each candle is hand made with love and attention in Hershey, PA. We strive to make each and every customer satisfied with their purchase. We will be adding new scents for every season. We would love to know any suggestions on new scents too! ​ In every candle is a hidden treasure. We hope you enjoy your candles. Please stop by our facebook page and show off your reveal. We would love to hear from you. Share your treasure with photos or videos. We want to see what you get! Don't forget to like our page, We will be running weekly contests of candles and more!!!" In every candle you will find a beautiful gold plated or silver necklace buried beneath the soy wax.﻿ You might be the lucky one who finds the iPad code or one the grand prize diamond Necklaces valued between $1,000 and $5,000. Every 500 Candles Sold, One Lucky customer will win an iPad 3. You will receive a treasure chest necklace with a special code to redeem your New Ipad inside your candle. With a choice of a white or black iPad3! I was lucky enough to receive the Country Closeline candle. This candle smells so fresh. It freshens up the entire house as well. The necklace that was in my candle is just beautiful. I am lucky to have been able to work with them on this review.These candles are only $24.99 and they ship for $5.99. The second candle ships for free! Please allow candles to burn down to reveal your treasure. If you dig out the treasure there is a good chance you will damage the item inside. Hidden Treasure Candles will not replace a broken treasure. I love candles, and to think candles could be made better with treasure! The necklace you got from your candle is gorgeous! I would like to win one of these candles!! Your necklace is gorgeous!! I would love one of these candles. They are nice and I have a candle obsession. WOW! I see these candles advertised now. I often wonder if they are worth it and what may be inside. Thanks for the review I can see now that they would make nice gifts! I love candles ! And to know they put a twist to it other than it burning down, I love it even more.. What an amazing review . Thank You for it. These candles are so unique and pretty! There are so many different scents to choose from, and I like so many of the scents and colors! I am getting one of these candles for Christmas! I love candles. I even love surprises....what a better way to combine 2 of the things I love! Oh and not to mention who doesn't love jewelry? I am a candle fanatic. I like to try all types and brands. 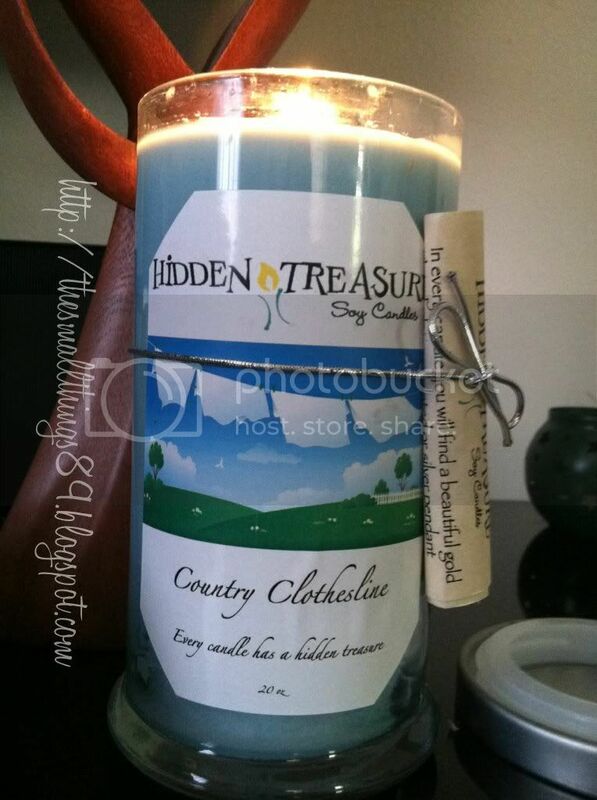 I wish you would have let us know a little bit more about your personal experience with Hidden Treasure candle. If they burn down faster than what is said, some candles have large wicks that accumulate and really smoke bad if you just blow them out. Do they leave soot? I know soy candles aren't supposed to, but I have had that happen. I am anxious to try these though! I've seen them advertised before and wondered if the 'regular' treasures were just gum all machine quality or even halfway decent, if yours was a regular treasure it is beautiful!